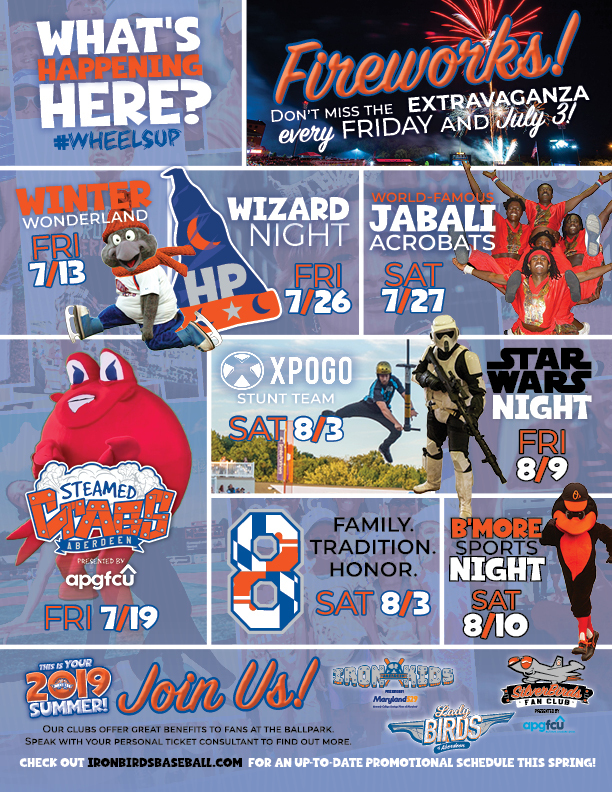 The club has placed a strong emphasis on bolstering its ties with community partners, becoming involved in efforts to assist local residents, and helping to guide our customers' attention to the organizations who can most benefit from the IronBirds' voice. 2018 was a record year for the IronBirds in donations, appearances and fundraising. Over the course of the 2018 season, the IronBirds made more than 380 donations to Harford, Cecil and Baltimore County-based non-profit organizations through fundraising, ticket donations, first-pitches and other in-kind initiatives, totaling over $138,000. In addition, Ferrous and Ripcord made over 90 appearances at schools, community events, business functions, little league baseball games and non-profit organizations. The IronBirds donated in-stadium promotional marketing tables to local law enforcement, military, and non-profit organizations. These organizations took the opportunity to be on the concourse of Leidos Field at Ripken Stadium on gamedays to fundraise, raise awareness, and promote themselves within the Harford County community. Examples include the Maryland Transportation Authority Police, MD State Police, Ashley Addiction Treatment Center, various organizations from the Aberdeen Proving Grounds military base, Visit Harford, and the Maryland Food Bank. Are you hosting a charity softball game, school fundraiser, church event or a private affair? Light up your event with some of Aberdeen's fan favorites Ferrous, Ripcord and even Kalvin the crab! Simply fill out our mascot request form to get started.